We start back to school next week. Here, at our house, no shoes required. We can wear pajamas or our bathing suits if we want. Yay! I absolutely love it. We work with the k-12 system, which is actually a rather well established private home schooling program. Now however, county governments in most states have started implementing private programs publicly, because the programs are highly successful, and because it actually saves the state money. 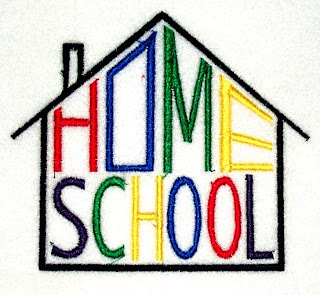 If you think about it, home schooling eliminates many costs. There is the cost of the school buildings, utilities, and busing. In addition, although the home school programs do provide teachers, each teacher can handle a much larger number of students than they could in a traditional classroom. The program designs our entire curriculum. I get on the computer every day and have a list of which lessons each of my children need to complete. We follow our county’s school schedule, and we have the same holidays. We participate in standardized testing, and my children have an online meeting with their teacher each month to assess their progress. We also send in work samples quarterly, which are critiqued by our teacher. In addition to all of this, my kids get the chance to attend online classes, usually for about an hour a day. They get to enter a virtual classroom with around forty other students from around the country. Super cool! This program is something that would be extremely difficult for our family to afford out of pocket. I can’t tell you haw absolutely blessed I feel every day. Not only does our county pay for us to have this awesome educational experience, we are actually saving the taxpayers money at the same time…Yes! My husband is a restaurant manager. He often closes the restaurant and gets home long after the kids go to bed. He is rarely off of work on weekends. K-12 offers us the opportunity to have more time together. We just don’t have the option of sitting down to a family dinner every night of the week. I have discovered that coaching my kids in school is the best vehicle I have ever had to spend quality time with them. I am just not one of those moms who can endure tea parties and playtime. I am really great at coaching though. So if your kids aren’t succeeding well in the school that they attend, or if you feel that your family could benefit from a more flexible school schedule, I would definitely recommend that you look into public virtual school. It is easy to find the information online and the programs are opening up in almost every state now. K-12 has benefited our family in countless ways. It gives my kids the room to learn in their own way, and be successful. It provides our family with more time to share, and it honestly saves us quite a bit of money. If you know anyone who is looking for an alternative to public school, K-12 is the first option that I would recommend.